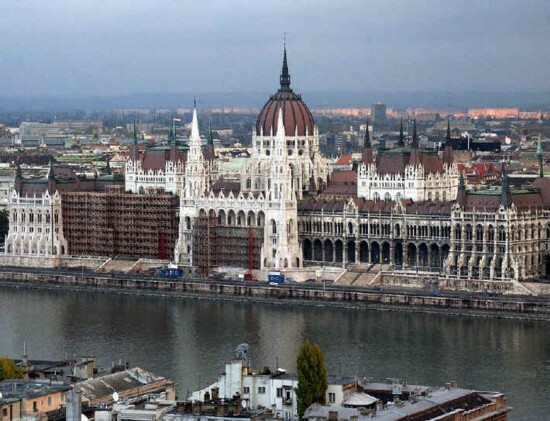 The Parliament or Országház was built between 1885 and 1902. The building has a length of 268 meters and a width of 118 meters . The parliament houses contains 691 rooms, 29 staircases, 27 gates and 13 elevators. The elegant dome has a height of 69 meters, and the surface has 18.000m2 (194,771sq ft.) The main style of the building is neo-gothic with renaissance influences, the base ground plan is Baroque, the interior of the building is Byzantine influence, especially in the marvelously decorated staircase hall.The Houses of Parliament of Hungary is one of the biggest parliaments in the world.